Genetic testing in research mode for beta-thalassemia is available through the GOMED programme for rs33915217, rs33971440, rs80356821, rs35699606, rs63750783, rs80356821 and rs63750223 that are prevalent variant in South Asian Populations. The tests can be requested only by Registered and practicing Clinicians. 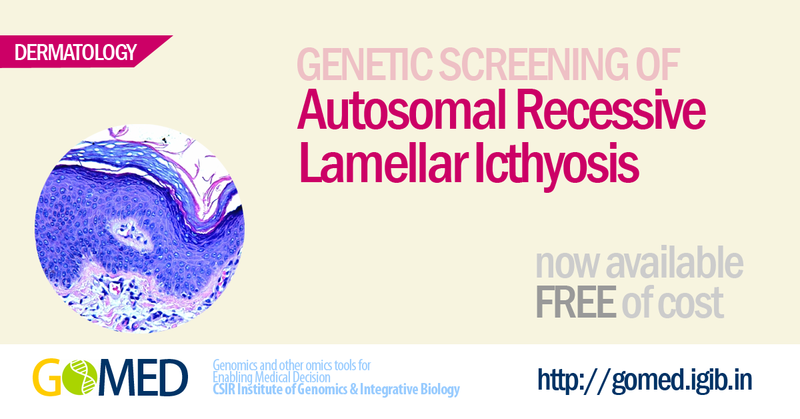 If you are a patient, you could contact your consulting clinician to refer you for genetic screening. Beta-thalassemia is a blood disorder that reduces the production of hemoglobin. People with beta thalassemia, have low levels of hemoglobin lead to a lack of oxygen in many parts of the body. It is one of the most common autosomal recessive disorder in the world. 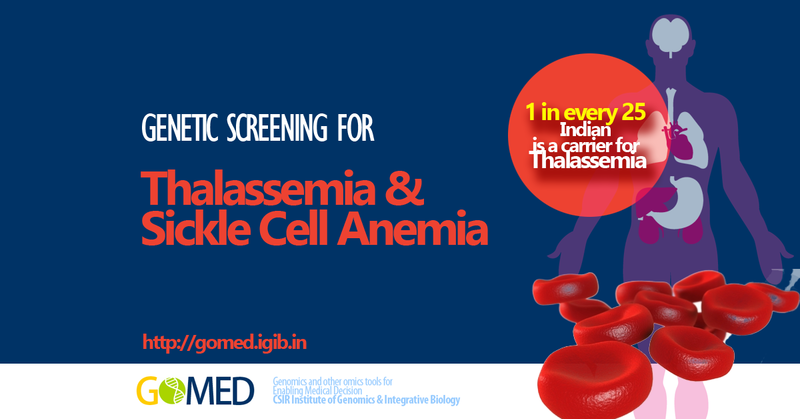 The overall prevalence of β-thalassemia varies between 5-15% across India. Hemoglobin (Hb) tetramer is made up of two alpha globin and two beta globin chains (alpha2beta2). Beta thalassemia is caused by the reduced (beta+) or absent (beta0) synthesis of the beta globin chains of the hemoglobin. There are three major clinical conditions associated the beta-thalassemia carrier state, thalassemia intermedia, and thalassemia major. The beta-thalassemia carrier state is clinically asymptomatic and results from heterozygosity for beta-thalassemia. Thalassemia major is a severe transfusion-dependent anemia. Thalassemia intermedia comprehends a clinically and genotypically very heterogeneous group of thalassemia-like disorders, ranging in severity from the asymptomatic carrier state to the severe transfusion-dependent type. A number of genetic variants are associated with Beta-thalassemia on HBB gene. The common mutations in Indian population include: IVS,1-5G→C(rs33915217), IVS,1-1G→T(rs33971440), Codon 41/42 (-TCTT)(rs80356821), Codon 8/9(rs35699606), trp15-to-ter(W15X)(rs63750783), and IVS1,25-BP DEL(rs63750223). Suxamethonium (Succinylcholine) is an adjunct to general anesthesia, to facilitate tracheal intubation, and to provide skeletal muscle relaxation during surgery or mechanical ventilation. Succinylcholine, is a fast-acting depolarising muscle relaxant and is widely used in clinical settings. 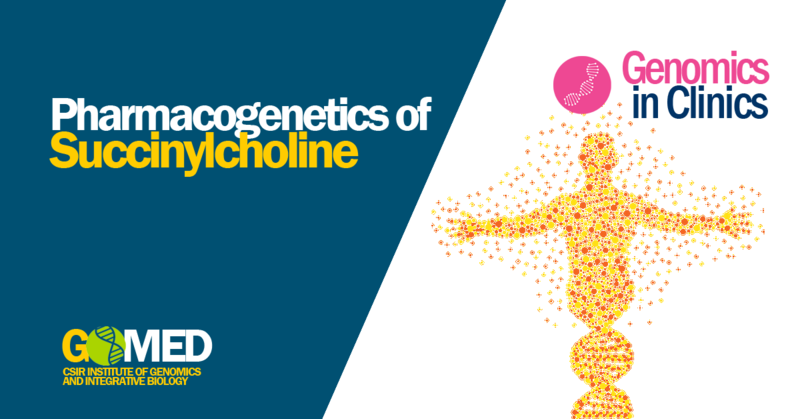 Succinylcholine is an analog of the neurotransmitter acetylcholine. The molecule binds non-competitively and therefore the binding cannot be reversed and recovery is spontaneous. The molecule is metabolised by the BChE enzyme encoded by the BCHE gene. Patients with normal BCHE gene hydrolyze 90% of the injected drug dose before it reaches nerve synapse in the muscle. In contrast, subjects with an abnormal BChE gene results in a huge overdose leading to prolonged muscle paralysis, a serious and potentially lethal adverse drug response. Apart from succinylcholine containing drugs Quelicin & Anectine, the gene also is involved in metabolism of mivacurium, ester local anesthetics particularly chloroprocaine. The prevalence of BCHE deficiency varies with population as well as ethnic subgroups. The incidence is approximately 1 in 100,000 individuals of European or American descent being homozygous for the variant, whereas some ethnic subgroups, including the Vysya community of India have a high prevalence of approximately 4%. Tuberous sclerosis is a rare disease which characterized by the growth of numerous benign tumours in different parts of the body. The tumours largely arise in the skin, brain, kidneys, and other organs. Almost all people affected have characteristic skin abnormalities, which usually present as patches of light-colored skin, areas of raised and thickened skin, and growths under the nails. The disease is estimated to affect approximately 1 in 6,000 people worldwide. Screening of exons of TSC1 and TSC2 gene using capillary sequencing. 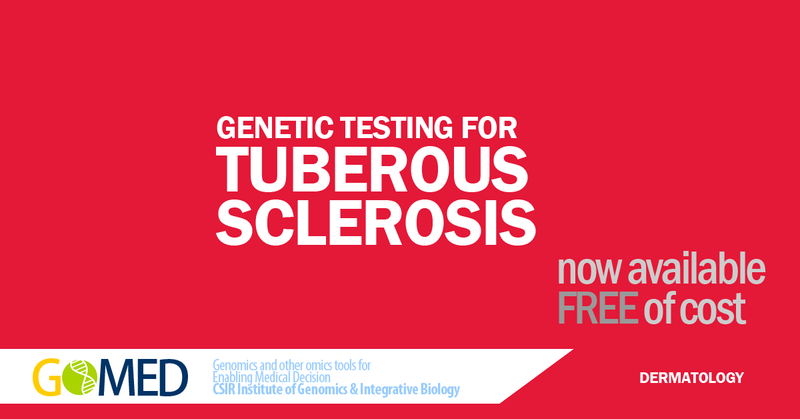 Please note: We would have a longer turnaround time for the initial patients being screened for this gene. The present expected turnaround time is estimated to be 12-24 weeks. Lamellar Icthyosis is a dermatological condition characterized by thick and scaling skin. In neaonates and infants, this could manifest as a thick sheath, otherwise known as a colloidon membrane which dries and peels off during early weeks. Affected individuals may also manifest with additional features including hair loss, abnormal nails, redness of skin, recurrent infections, and thickening of palms/soles. Screening of exons of TGM1 gene using capillary sequencing. Dowling-Degos disease is a pigmentary disorder of the skin characterized by reticular hyperpigmentation with generally a flexural distribution. 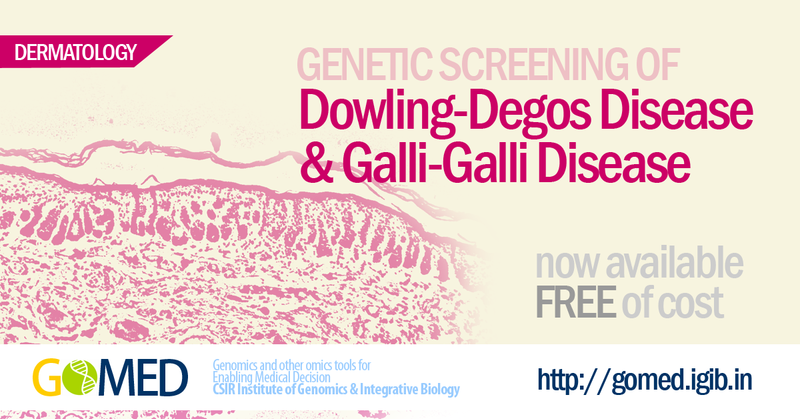 Acantholysis is seen in some cases, and is generally classified as Galli-galli disease, though the general consensus is that Dowling-Degos and Galli-Galli disease are the spectrum of the same disease. The disease is extremely rare with only a handful of cases reported in literature and the population frequency is unknown. Several cases of the disease has been described previously from India and around the world. Screening of (KRT5):c.10C>T mutation using capillary sequencing. Fluorouracil (5-FU) is a commonly used anticancer drug. It functions by irreversibly inhibiting thymidylate synthase. 5-FU is widely used in a number of cancers worldwide and is in the WHO list of Essential Medicines. Detoxification of 5-FU is mediated by the dihydropyrimidine dehydrogenase (DPD) gene. Apart from 5-FU, the gene also is involved in detoxification of Capecitabine, and Tegafur. Genetic variations in the gene can cause a partial or complete deficiency of function, which may lead to drug toxicity, which are severe. The USFDA-approved drug label for fluorouracil states that the drug is contraindicated in patients with known DPD deficiency. CPIC Dosing Guidelines for fluoropyrimidines recommends an alternative drug for patients who are homozygous for DPYD non-functional variants as these patients are typically DPD deficient and a 50% reduction for heterozygous patients.